It's been a while since I've posted (I'm winding down my blog, in response to a busy new job and general life-ness) but I thought I've had a couple of good Japanese meals recently so I thought I'd do a little review. 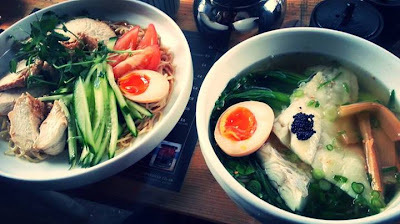 First - Tonkotsu, the much-acclaimed ramen joint in Soho. Having spent the past few months on Urbanspoon's "Talk of the Town" list, I was eager to see what the fuss was all about, so I went along with a couple of friends for a casual Tuesday-night meal. The restaurant was relaxed and stylish, and the food - huge bowls of warming, ramen noodle soup, with rich, umami stock and tasty chunks of melt-in-the-mouth pork belly - was undeniably very good. However, I didn't really get the hype: everything was tasty, but it was nothing exceptional, and it wasn't miles above what you could get at somewhere like Wagamama. So, on to my second review - Akari. This is one of my favourite Japanese places in London. It's not officially a restaurant - it describes itself as an "Izakaya", a traditional Japanese drinking establishment. In line with that theme, Akari is decked out like (a classy, oriental-esque) pub, with dark wood panelling and a prominent bar. Despite being situated quite far along Essex Road, away from the hustle and bustle of Upper Street, Akari always seems to be busy. It attracts all sorts of clientele, from couples on first dates, to families with young children (sashimi and miso cod is admittedly a bit more exciting than fish fingers and chips!). When I first moved to London I lived just around the corner, and we used to go fairly regularly. After a disgracefully long hiatus I finally managed to get back there earlier this week, with my mum and boyfriend in tow, and was pleased to find it to be as good as I had remembered. The food really is exceptionally good, and at about 30 quid a head including drinks (this time round, a couple of glasses of plum wine for the ladies and a few pints of asahi beer for the gent), it is outstanding value. Having not visited for a while, I domineered the ordering process, ensuring that all of my favourites made the cut. We ordered three starters, three mains, and three sides, with a pudding to share at the end, and finished our meal fit to burst. Prawn tempura - some of the best I have had anywhere. Incredibly light golden batter encasing huge, piping hot king prawns. Delicious. Squid tempura (aka calamari!) - juicy strips of buttery squid, in that same fluffy tempura batter. Miso cod - a stand-out dish: delicated fillet of cod baked in a sweet white miso marinade - slightly caramelised on top and meltingly tender inside. An absolutely gorgeous dish. Both restaurants are very reasonable compared to other Japanese restaurants in London, but if you want something really exceptional for your money I would have to recommend escaping the Soho crowds and giving Akari a go.